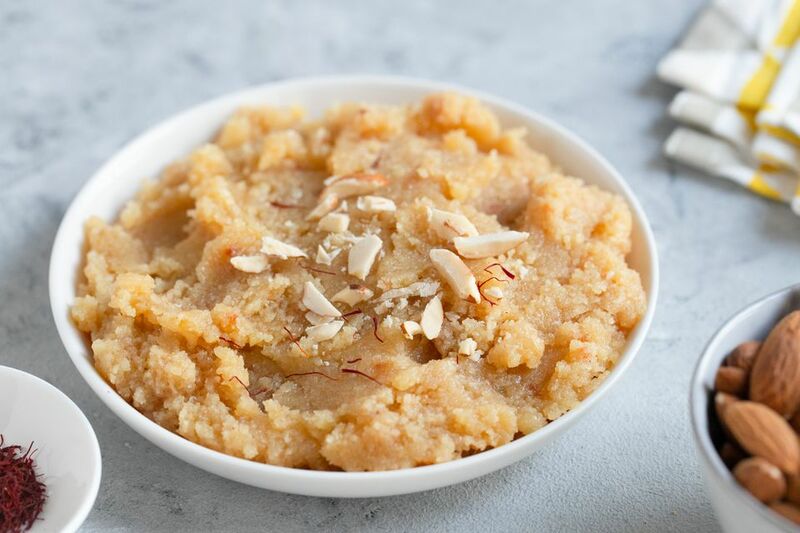 Badam Halwa is a regal dessert fit for Kings! While the recipe does not call for too many ingredients, nor is the process a complex one, it takes love and time to make a good Badam Halwa...you literally need to stand over the pot and stir constantly to prevent the Halwa from scorching or burning. Don't let that scare you off though, as the end result is well worth the effort. Treat your family and friends to Badam Halwa and they will love you for it. Put the almonds in a deep bowl and add enough hot water to them to cover them. Leave them to soak for 3 to 4 hours. Once the almonds have soaked, remove their skins. To do this press each almond between a thumb and forefinger and slide your thumb forward. This will make the almond slip out of its skin. Do this for all the almonds. Discard the skins. Put the skinless almonds into a blender and add the milk to them. Blend the mixture to form a coarse paste (the same consistency as sooji/rawa). Set up a deep, heavy-bottomed pan on medium heat. When it is hot, add 3 tablespoons of ghee to it. When the ghee melts, add the almond-milk mixture to it. Stir well. Now add the sugar to the mixture and stir to mix well. Add the saffron strands and mix well. Once the splattering stops (a sign that the Halwa is almost done), add the remaining ghee and the food coloring and stir well. Keep cooking the mixture until most of the moisture in it dries up. It will start to come away from the sides of the pan now, and you will also see a small amount of the ghee begins to separate from it. You will know the Halwa is ready when it no longer sticks to the pan at all. In fact, when you look at the bottom of the pan, it will be clean. Take the Halwa off the heat and spoon it onto a flat platter or plate to cool. Serve warm or at room temperature in bowls, garnished with a pinch of thin almond slivers!